Banners have a broader, more powerful presence in contemporary American life than ever before. The new exhibition “Word on the Street,” which is now available to view at The Watermill Center in Watermill, NY, centers banner-making and vibrant, provocative messages, in a series based on a collaboration between poet and writer Anne Carson and Brooklyn-based Iranian-American performance artist Amy Khoshbin. The Sag Harbor Express describes the content of the exhibition, paraphrasing Khoshbin: “Though they are museum-worthy…the first banners were created for the Women’s March which took place in Washington DC on January 21, 2017 — the day after President Trump took office.” The artist would then reach out to Carson to help provide the language which would prominently feature on those banners. 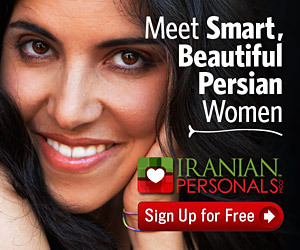 Sponsor Message: IranianLawyers.com, directory of verified Iranian lawyers from the United States and around the world. A Banner by Anne Carson and Amy Khoshbin at the Women’s March in Washington DC in 2017. Khoshbin articulates that, “The real power is to have these objects in the street as protest objects and demarcations of time.” Fortifying themes of community, multiple writers and contributors would end up supplying slogans and text for the banners by request, making the exhibition a truly developing collaboration among multiple women, and one that is ongoing. Even the banners themselves are actually fabricated by a group of primarily Middle Eastern and Afghani female refugees who live in San Antonio, Texas. “Word on the Street” runs at The Watermill Center until April 17th.